"On the approach from the north-east, the town has a very picturesque appearance. 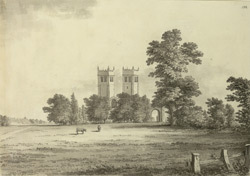 The magnificent towers of the church (St Peter) are seen lying in a valley, and the elevated ground in the distance, beautifully clothed with wooded scenery, finely contrasting with the cultivated scene around you. Its situation is indeed delightful, and both nature and art have contributed to its beauty" . Extract taken from 'White's Directory' .